Our thoughts about money have more power than we think. For example, if we have positive thoughts about saving money, we’ll be motivated to accumulate money. When we are motivated, we will look for all sorts of creative ways to save money everyday and even feel good about it! But what if we have negative thoughts about money? Money in itself is a neutral object.. The meaning we attach to money will determine how we handle money in our lives. If we think money is evil, chances are: it will be hard for us to make money. That’s because our minds link money with something bad! If we think we are blessed and surrounded with abundance and rezeki, we will feel at peace even if we live in a small makeshift hut in a forest. Our minds and thoughts have great power over our feelings and actions. That’s why it’s important to have a healthy mindset about money. But what if we already have negative beliefs about money drilled in our minds since young? There are 2 stages how you can change your unhelpful money mindset. Stage 1 is about catching our unhelpful thoughts. This is not as easy as it seems. Our thoughts happen in a flash and we are not used to catching them. If you have many thoughts in your mind, identify the ones which make you feel the worst. If you are still not sure how to start, below is an example. How do we catch our unhelpful or negative thoughts? a. Negative thoughts happen immediately after an event. b. Negative thoughts are believable and true at that point of time. For example: At the point of time when you were informed of the cost of surgery, your thought that “Money is hard to save in Singapore” was loud and true. Our negative thoughts usually have a similar pattern. At this stage, just be aware of them. In Stage 2, we will use evidence and facts to change our unhelpful thoughts. For this to work, we can’t change from one thought to the opposite thought – that will be too drastic. For example, we can’t change a negative thought from “Money is hard to save” to “Money is easy to save” in an instant. Our aim is to create a new, realistic thought which is more balanced using evidence and facts. Why do we use evidence and facts? Because we can’t argue with evidence and facts. They are objective. This is a way for us to ‘trick’ our minds to change a negative thought and create a new one. For example, let’s say we have a negative thought that says “Money is hard to save.” How do we use evidence and facts to change this belief? Step 1: Find evidence that money is hard to save. a. I can only save $200 every month even after cutting my budget. b. I have to relieve stress by spending a lot of money on holidays and luxury goods. c. Singapore is an expensive country – everything costs money. Step 2: Find evidence that money is EASY to save. a. I have saved $500 once – which is more than my usual $200. c. I can choose to prepare and bring my own food to work even though it takes more effort. d. I can choose to reduce my $6 a day coffee habit. Step 3: CREATE new, realistic thoughts which are balanced. a. Singapore is an expensive country, but if I make small changes like reducing my indulgent eating habits, I can save more money than usual. b. I like to go shopping and go for holidays to escape stress. But if I make the effort to research for stress-relieving methods which don’t cost much money, money is easier to save. Demoralised “Money is hard to save in Singapore.” a. I can only save $200 every month even after cutting my budget. b. I have to relieve stress by spending a lot of money on holidays and luxury goods. No choice. 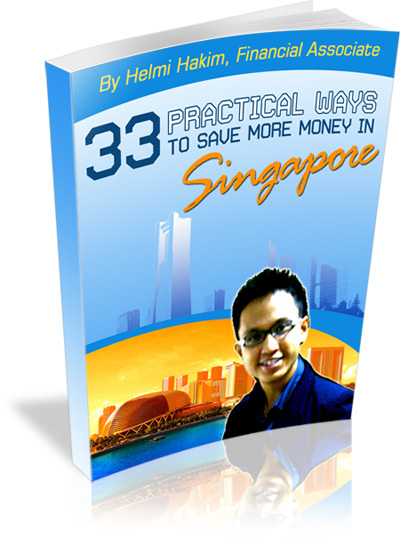 c. Singapore is an expensive country – everything costs money. a. I have saved $500 once – which is more than my usual $200. b. I can research for stress-relieving activities which don’t cost a lot of money. c. I can choose to prepare and bring my own food to work even though it takes more effort. That can easily help me save money. d. I can choose to reduce my $6 a day coffee habit. This is an easy thing way to save extra cash. a. Singapore is an expensive country, but if I make small changes like reducing my indulgent eating habits, I can save more money than usual. I’ve met many prospects who have a negative viewpoint of money. I’ve also met people who have a healthy connection with money. Usually, those with a healthier mindset about money will find it easier to save and pay off their debts. Because thoughts lead to feelings which lead to behaviour. Positive thoughts about saving money —> Positive feelings about saving money —>More effort to save and plan their income. If you need a coach and mentor to help you to plan your finances the shariah-compliant way in Singapore, you can Whatsapp me at 96520134. See you soon, Insya Allah.